What took you hours then will now take you seconds with a mixer grinder. In fact, with recent advancements its not just grinding masalas, these mixers can also efficiently juice fruits and even knead Atta. So if you have been on the lookout for such a mixer grinder you have come to the right place. In this buyer’s guide, we will give you all the tips, in-depth reviews and comparisons you need to find the best mixer grinder in India for 2019. Preethi Zodiac MG 218: If you want the very best in the Indian market an willing to pay the big bucks, the Zodiac is everything a mixer grinder should be. From making chutneys, shakes, and juices to even slicing, chopping, grating veggies or mincing meat, there is nothing this mixer grinder cannot do. And wait, there is also the Idli and Dosa batter that it can prep in minutes. Sujata Powermatic Plus: If you are looking for a juicer mixer grinder, the Sujata Powermatic Plus, is just what you need. With a 900-watt motor and honeycomb filter mesh for smoother juices, you can give your family fresh, healthy juices all day long. Oh, and it is quite an efficient grinder and mixer as well. Lifelong Power Pro LLMG02: On a tight budget? While the Lifelong Mixer Grinder may lack the power of the high-end models for juices, it is great for chutneys and standard chopping because of its 3-speed setting and stainless steel blades. If you have the money to spend the Preethi Zodiac MG 218 Mixer Grinder is a multi-purpose mixer grinder that is going to make your life in the kitchen a whole lot easier and save tons of time. Here’s how. You want all your mixing and grinding etc. to be done in a flash, right? Guess what, with a 750-Watt Vega W5 motor, the Zodiac delivers precisely that. But exactly how quickly? Well, it kneads dough and grinds turmeric in under 1-2 minutes, chopping requires a mere 2-3 pulses and you can grind urad dal for 30-minutes straight (making those lip-smacking vadas and Bondas does not get any easier or faster). Also, mixing, grinding, chopping or even juicing, all need different speeds. This is why, apart from a pulse, the mixer also has 3-speed settings. The 2.1-liter Master Chef Jar is an absolute standout and here’s why. With the Citrus Press attachment, it can churn out 750g of fresh orange or lime juice for you. In the mood for some Chinese? Have finely sliced carrots, onions, etc. ready in under a minute. In short, if you don’t like buying packed juices, coconut milk, lassi’s etc. this Juicer Jar is exactly what you need. There is also a 0.5-liter jar for all your green and tomato chutneys (because it is the chutney that makes the Bonda’s or Pakoda’s finger-licking good). 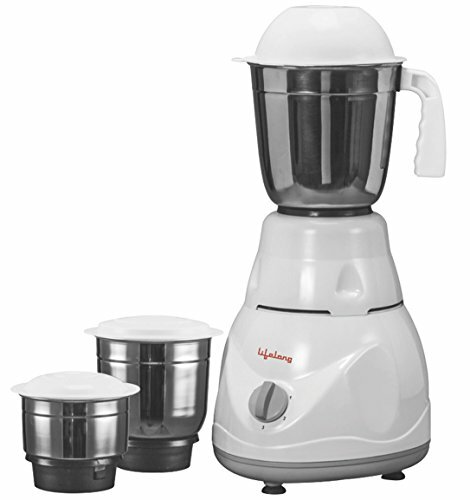 Not to forget, the 1.5-liter wet grinding jar too which gives you the perfect idli and dosa batter in quick-time. To give you the perfect combination of fine grinding, slicing, and durability, all blades are razor sharp and made of stainless steel (no rust is going to play spoil-sport with these bad boys). The ABS Plastic build of the mixer grinder makes it shockproof while its tripod design and vacuum footings at the bottom keeps it stable which, in turn, prevents spills, breakage, etc. It also has a user-friendly interface so whether you are using a grinder for the first time or not, becoming an expert at it takes mere minutes (even your maids can use it). It comes with a 5-year warranty on motor and 2-years on the product. Lastly, in case of an overload, the safety indicator turns from blue to red. This indicates the motor has tripped and the mixer will only run once the protector is reset using the button at the bottom (so your mixer won’t turn into a smoking mess). It is the most expensive mixer grinders on the list but if you have the funds, this one you do not want to let go. It has a 3-Speed setting and pulse for all types of grinding, chopping etc. Sujata is a well-known Indian brand when it comes to kitchen appliances. Yup, this Indian brand has a surprise in store for you with its juicer mixer grinder. The Powermatic Plus has one of the most powerful motors on the list as it comes equipped with a 900-watt motor (so you know it is going to be super quick with the grinding and mixing). It too comes with 3-speeds to give you the perfect grind, mix or blend each time. The speeds can be easily controlled with the rotary switch. For easy and quick chopping of veggies, there is also the whip button or what you commonly know it as, the Pulse function. Back by the 900-watt motor, this mixer grinder can give you fresh juices without compromising on taste and aroma for 90-minutes straight so there going to plenty for everyone. And if you hate too much pulp in the juices, you will be quite happy to hear about the honeycomb filter mesh which ensures your juices are smoother and finer. There is also a 1.75-liter blender jar that is perfect for anyone in love with lassi’s, smoothies or wanting to prep their protein shake in the fastest and easiest way. If you like home ground masalas, rev up the 1-liter jar and have turmeric, black pepper or even red chili powders in a minute or two. But that’s not all, with this jar you can also grate carrots for the much-loved gajar ka halwa or prep idli and dosa batter with utmost consistency and fluffiness. And if you have guests coming over, the 400ml jar can be used to grind up some quick green mint chutney so you can treat your friends to some mouth-watering potato or onion pakodas (want to spice it up? Try Mirchi ka pakodas, a personal favorite). Blades for each purpose have been made using stainless steel so there is no question over their durability and since they are razor sharp, they can grind through anything in minutes. This mixer too has an ABS build so there is no chance of electrocution in case of a short-circuit. Also, the motor has a special double ball bearing for increased durability and lower noise levels (now enjoy with hassle-free functioning for years to come). To prevent spills and vibrations during full-speeds, the mixer has vacuum footings at the bottom which keep it stable at all times. Also, cleaning after juicing can be a little tedious. Though there is a pulp collector, splatter all across the lid and other parts is common especially at higher speeds. Need a mixer grinder on a budget? Lifelong has the perfect solution for you with its Power Pro LLMG02 mixer grinder (FYI, an Amazon best-seller). While the 500-watt motor may not be the best fastest, it, more importantly, is efficient. So while grinding turmeric etc. may be slower, it is definitely going to be just as fine as you want. And to ensure that, the mixer has 3-speed settings with a pulse so you have all the control you need over the chopping, grinding and blending. If your breakfast isn’t complete with fresh fruit smoothies, the 1.25-liter liquidizing jar is the what you need. And if you prefer to powder your masalas at home and grind rice or dal for idli batter or vadas, you will find the 0.8-liter dry and wet grinding jar quite handy. Plus, for your evening samosa or pakoda snack time, the 0.5-liter chutney jar will give you perfectly smooth green and red chutneys. But what’s really special about these jars is that each has been equipped with the flow breaker technology. This is especially useful in wet grinding as it ensures all ingredients fall onto the blade evenly resulting in a fluffy and better-aerated batter. The blades, just as we would want, are all stainless steel so know they will not rust away and are easy to clean. Also, their sharpness makes it possible for them to grind through all vegetables in minutes. The simplistic and compact design of the mixer ensures hassle-free usage each time without taking up much room on the counter. And when not in use, it will easily fit into most kitchen cupboards. You can get a 1-year warranty with the mixer which can be further extended if need be. There is also a motor overload protector which warns you about any overloading and trips the motor ensuring you long-lasting operation without costly repairs. On the downsides, the mixer is not ideal for juices but can prepare really smooth shakes in the blender. The motor of the blender in 500-watt which though perfect for every day grinding and blending, it is not as powerful as the previous picks and thus a little slower. The durability of the mixer also does not match those of higher-end but should comfortable last you for 2-3 years without any overhead expenses. Downsides aside, for a price of less than Rs. 1,500, the Power Pro LLMG02 comes with all basic grinding and blending features everyday kitchen work demands, making it the best mixer grinder in India for anyone on a budget. 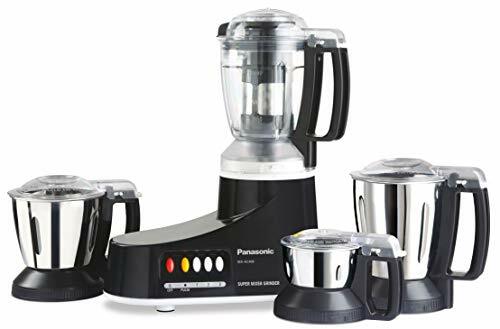 From home appliances to mixer grinders that can work their magic even in the kitchen, Panasonic is one of the mainstay brands in India and their MX-AC4000 grinder mixer is just another example of their reliability and durability. The 550-watt motor in tandem with the 3-speed setting, pulse, and different jars and blades make the mixer grinder anything but ordinary. From beating eggs, mincing meat to wet and dry grinding, there is plenty this mixer can do. The 3-speed and pulse can be controlled using various buttons which is easier to use and give you utmost control over the mixing. The 1.5-liter polycarbonate jar comes with a special filter using which you can make stuff like soya milk, coconut milk, tamarind extract etc. right in your kitchens (say goodbye to the expensive and unhealthy packed stuff). The jar is also perfect for fresh fruit and vegetable juices and without the filter ideal for shakes and smoothies. 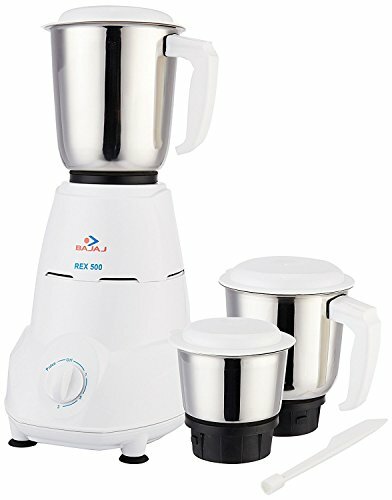 With 1.5-liter stainless steel jar, you can grind rice and urad dal for vadas, idli or even dosas. The 1.1-liter mill jar can be used for the same too or for even grinding coffee beans. There here is also the 400ml chutney jar as well (because what are bread pakodas and even biryani without some green mint chutney on the side, right). All jars used for grinding comes with flow breakers which that ensures all ingredients mix up well and the batter and chutneys have a perfect consistency each time. The stainless steel and super sharp blades of the mixer can slice and grind the hardest of ingredients in seconds and remain so for many years (just what you would expect from ‘samurai-shaped’ blades). Like any top of the line mixer grinder, this too will stick by you for plenty of time to come with little to no repair or maintenance, all thanks to the ABS body. Adding to the durability is the self-lubricating oil seal feature of the motor that automatically lubricates the blade shaft protecting the motor from Co2 emission, in turn, increasing its longevity. Not to forget, there is also an overload protector for the same, especially helpful if you live in areas with constant power fluctuations. Also, to ensure safe operation, the mixer grinder has a dual safe mechanism. This means that until the jar lid and jar itself are not locked in right, the mixer will not start (this one, even your 15-16-year-old kids can use). The motor is only 550-watt so anyone looking for more power will be a little disappointed. Plus, you cannot knead atta using the mixer. Also, the locking mechanism of the mixer can be hard to understand at first. A Special filter helps extract juices, soy milk, coconut milk etc. Samurai-Shaped stainless steel blades and sharp enough to grind through toughest of ingredients and very durable too. 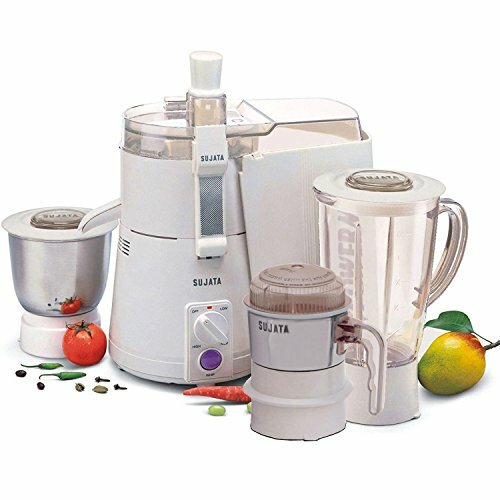 Last but not the least comes another top-notch mixer grinder from another one of the very popular brands in India, Bajaj. Here’s what this one can do. Not the most powerful but very efficient and ideal for multiple purposes, in simple words, that is how we would describe the motor of the Rex mixer grinder. What tasks, you ask? We have that covered below. But before that, a mixer must have different speeds and pulse for a quick-fire chop or grind. Luckily, this Baja mixer has a rotary switch just for that. Coming to what this mixer can do. The 1.2L liquidizing jar is quite handy when it comes to wet grinding (batters or shakes, this is the jar you need). Then there is also a 0.8L dry grinding jar for grinding turmeric, red chilies etc. (whatever you need for daily cooking). And to keep snack time yummy and spicy, you can use the 0.3L chutney jar. To maintain the expected quality standards, the Rex blades and jars are built with stainless steel so you get years of rust-free service. Not to forget, the sharpness means, it takes the mixer seconds to grind through most ingredients. Giving the mixer its premium build is the ABS plastic material that is rust and shockproof and since it is white in color, it blender with any kitchen décor. And so the mixer does not slip or slide causing the batter or chutney to spill all over the counter, there are vacuum feet. Also, so the motor remains safe and sound even during a power surge, there is an overload protector. The motor is only 500-watts so it isn’t very powerful and likely to be slower than the other mixers on the list. You cannot extract juices with the mixer grinder. Who Should Use a Mixer Grinder? Any homeowners and chefs can benefit from a good mixer grinder. You can use it for preparing chutneys, side dishes, etc. This is specifically for those who don’t have enough energy and time for mixing and grinding by hand or are looking for an upgrade on their old mixer grinders. Multi-tasking is highly needed when cooking and, a mixer grinder can provide you with that type of versatility you want. You can use it for grinding and mixing any fodder items simultaneously. Following are other advantages of owning one for your kitchen. We know life is already hard enough especially for working women and having a mixer grinder can come a long way is making that easy. How? Well, because over the years, mixer grinders have advanced. With better blade designs, powerful motors, speed control and tons of attachments, the grinders can chop, slice and dice, grind, mixer or even juice within minutes. So whether you are preparing some yummy Chinese fried or noodles and need diced veggies, need some chutney to go with the pakoda, want grind turmeric or just serve some yummy juices to beat the heat, you can do it all within minutes. Like I said above, the top grinders today are not your average mixer grinders that will only grind masalas. Their speed control and multiple blades and jars make them ideal for even wet grinding. Yup, you no longer need a separate bulky mixer to get some fluffy idli or dosa batter (mind you, they are still awesome grinders), some green mint chutney or a juicer for the occasional fresh orange or apple juice. Mixer grinders like the Preethi Zodiac or Sujata Powermatic are pretty handy even as juicers. But you can always check out our post on the best juicers in India for 2019 in case you are looking for something even better and badder at juicing. Remember the time when running the mixer would wake everyone up from sleep or give them and you a headache? Not anymore. While mixers can still be loud, noise levels have significantly reduced with some mixer generating not more than 50dB. Not just that, you also do not have to take a hit on your pocket due to high electricity bills as mixers nowadays consume little power while delivering maximum performance. The simple design of most mixers makes them really easy to use (even if you have never used one before). You also get a manual with all the details and there are tons of videos. Plus, they come with tons of safety features so you can even let your kids or the maid use them as well. Below is a list of the features that separate the best mixers from the rest. Well, power is both a boon and a curse, in life and even in a mixer grinder. While 750-watt mixers are going to be faster and can grind through almost anything ingredient you throw at them they also tend to be noisier and more expensive. But if you are looking for something mid-range or on a budget, a 500-watt motor should serve you just as well. Though they tend to be a little slower, it can still get the job done quite well. If there is one functionality that a mixer cannot do without it is speed control (because you cannot be grinding everything at one speed). Chutney, turmeric powder, idli batter and juices, all require different speeds. So if you want a versatile mixer, 2-3 speed controls are a must. This is one feature that makes most mixer grinders safe for people of all ages. Why? Because until and unless everything is fixed correctly, the motor does not begin. Not only does this prevent spills but also protects you and your loved ones from any harm (trust me, those blades are sharp). So whether you go for a cheap mixer or the best, this one feature you do not want to skip out on. Do you happen to live in an area with lots of power cuts and fluctuations? Then are overload protection is going to be a lifesaver as it increases the durability of the mixer motor as it trips the motor in case of any fluctuations and can be restarted through the switch given below. You may not think this is a big deal but it actually is. That is because a safety lock alone does not guarantee your safety. What if the mixer at full speed happens to fall off or slide away? Risky, isn’t it? The vacuum footings keep the mixer rooted to the countertop so no slipping and sliding will harm you, your mixer or your ingredients. You cannot be doing all the mixing in one jar. Imagine if you had to prep some batter and chutney at the same time, the amount of cleaning and emptying it would need? That is why mixers come with multiple jars. Some bigger, some smaller and meant simply for juices and shakes. The 1.5-liter jars can usually be used for blending, grinding etc. The 1-liter jars can help you with all the wet grinding while the smallest of all (0.5-liters) are usually used for chutneys or even grinding coffee beans. Also, stainless steel jars tend to be more durable than polycarbonate or other jars so make sure at least the dry and wet grinding jars are made of stainless steel. Like the jars, the blades also define the versatility of the mixer grinders. While there may be plenty of blades for different tasks, the one thing that remains common between them is that a stainless steel build is a must. This makes the blades not only durable as they are rust-resistant but also very easy to clean. You simply rinse off most of the residue. Chutney Blade: Chutney blades that are ideal for chutneys or even tomato puree. Dry grinding blades: These can be used for all the masalas, powdering rice, sugar or even to create pastes and purees in larger quantities. Wet grinding blades: These won’t just give you awesome fluffy batter but some of them can even beat eggs, make shakes etc. Grater: The top mixer grinders like the Preethi Zodiac also come with graters that be used to grate vegetables, fruits and even cheese. Slicer and Shredder: You can also get blades for slicing and shredding vegetables that great for Chinese cooking. Note: Some mixers also come with a dough kneader which can help you prep atta for the dinner within minutes. The pulse function is something you will be needing more than often, especially when blending up shakes, lassi or even chopping vegetables because like I said before, not everything can be done at the same speed. Most of the mixer grinders are made using plastic but the kind of plastic used makes all the difference. The premium models usually use ABS plastic. Not only is this highly durable but also makes the body rust-resistant. The mixer should be compact so it does not take too much space on the countertop and can also be put away in any of the kitchen cupboards when not in use. Also, the more compact the mixer, the easier they are to clean. Features a compact size and simple design. You can find traditional mixer grinders in most households for grinding small to large quantities be it wet or dry grinding. A hand-held grinding/mixing device. It is mounted on an insertion over containing a motor. However, this motor is not very effective compared to stand mixers. You might end up mixing or grinding semi-liquids together. This machine is commonly used as an eggbeater and with all types of the bowl. A great tool for mixing hard ingredients together. Thanks to its powerful motor which facilitates easy grinding or mixing. Perfect for whipping cream, making batters, and kneading the dough. While it is seldom used in kitchens, stand mixers can be vastly found in food industries, like bakeries. Generally used to extract fresh juices from vegetables and fruits. It comes along with two to five jars. Some additional features are included. Though, the price is a bit higher than normal mixer grinders. 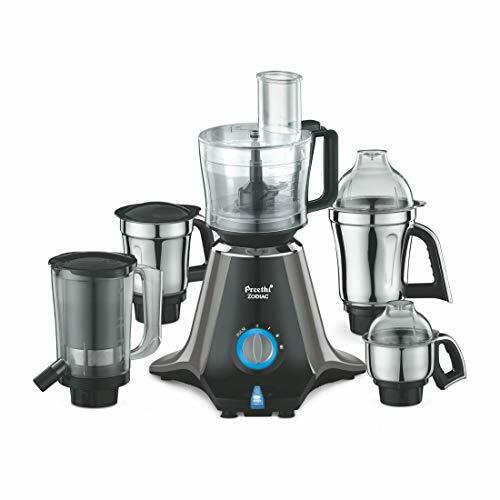 Yes, not all but some mixer grinders come with jars and blades that turn your mixer grinders into a highly efficient centrifugal juicer like the Preethi Zodiac and the Sujata Power Matic. The Zodiac has a special 3-in-1 Insta-Fresh Juicer that lets you blend shakes, juice fruits, and veggies or even extract coconut milk etc. Similarly, the Powermatic has a honeycomb filter for efficient juicing. If you want to give the mixer grinder a deep clean, just add in some detergent and water and hit the pulse button. As for the body of the mixer, a wipe with a damp cloth should be able to rid of any stains. Lastly, considering you own a dishwasher, you can also check the manual and see what parts of the mixer are dishwasher-safe (that surely will make cleaning hassle-free). There, you have our complete list of mixer grinders to buy in India in 2019 and all the features that you should be looking for in them. So enjoy a less stressful and hassle cooking with your new mixer grinder and don’t forget to drop in a few comments in case you feel we missed out on something!